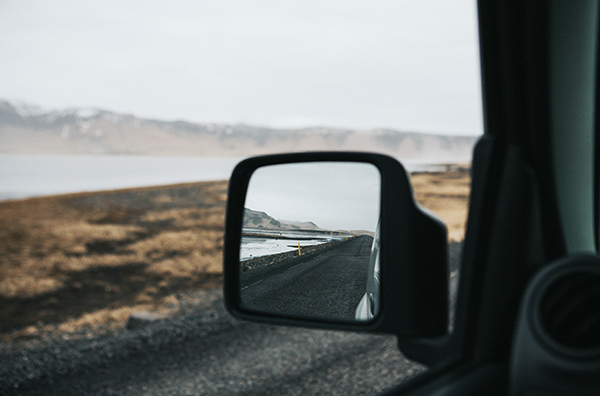 If you’ve ever read the fine print of a product disclosure statement (PDS) for a financial product, you’ve almost certainly seen ‘The past is not a reliable indicator of the future’. Admittedly, we even put it in the Stockspot documents because we’re obliged to do so. But in fact past returns can give you a much better idea about future performance than almost anything else. Markets tend to move in cycles so when one asset does well for a while that’s almost always followed by a period of doing worse. It’s known as mean-reversion and it’s why we rebalance our client portfolios out of investments that are up, into ones that have lagged. Here’s a visual chart which shows why rebalancing like we do is a sensible strategy. The green dots are past 10 year returns and the red dots are future 10 year returns. 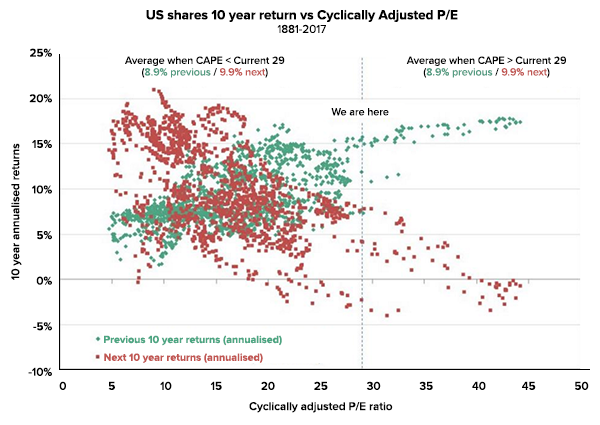 The chart shows that over the last 135 years of US stock market history, when the market has had a strong period of past performance like it has today (16% per year over 10 years), rising to similar valuation levels, the next 10 years looks much less exciting and average returns are closer to 2% per year. That’s right, share market returns in the US are likely to be much lower over the next decade. Think of it like the last 10 years having borrowed from the future and needing to pay it back. On the other hand, when the market has seen lower returns over the past decade, that’s when it’s more likely to have a strong 10 years ahead. How can this help you invest? Logically it would therefore make sense to be reducing the amount of an investment in your portfolio after it has risen for a consistent period of time and moving that money into areas that haven’t done as well. But is this what people do? Of course not! People typically invest more after markets have already risen… that’s why markets tend to ‘overshoot’. The largest ever inflows into US shares was in 1999 just before the tech bubble burst. Left to their own devices, people naturally ‘chase’ whatever has performed well in the recent past. We’ve even noticed some of our own client behaviour following this trend. Last year we offered 14 different investment themes that clients could add to their portfolios to boost their exposure to a certain market or investment. Think you can guess which ones have been most popular? Our 2 most popular themes over the last year have been Australian property and US shares – the 2 choices that had done best over the prior 5 years before they were chosen. We didn’t explicitly advertise that they had done well, but people chose them anyway. Seeing Sydney Auction results and US tech companies in the news all the time was probably good subliminal advertising and made people feel ‘warmer’ to those choices rather than say, Chinese shares. Interestingly, over the last year US shares and Australian property have fallen behind with returns of 17% and 7%. Meanwhile, our least popular themes, Australian large shares and Asian shares have returned 21% and 23%. You might be thinking, does that mean Australian property and US shares won’t continue to do well? Absolutely not. Momentum can be very strong in markets and trends can continue much longer than people expect. In the 1990s, the US share market kept rising well beyond many expectations from 1996 to 1999. But starting from 2000, US shares went nowhere for 13 years while the rest of the world caught up. The US market had tech stock indigestion and it took 13 years to recover. People who bought US tech shares in early 2000 waited a decade or longer to get their money back. It’s not that you should avoid investing after markets have risen. That’s not a wise strategy either, but after a streak of good returns it’s usually a good time to lock in some profits and look elsewhere to diversify away from whatever the ‘investment de jour’ is today. That’s how our rebalancing works for our clients – to protect some of what they’ve made and improve their potential to earn higher returns in the future.